« Cairns port expansion threatens to undermine our bay. When Townsville’s port was established back in 1864, it catered for small ships that plied largely up and down the east coast. It was in a large but well-sheltered bay, with a large river supplying water for the town growing up around the port and a rich marine life to help feed the growing population. It even had a beautiful coral-garlanded island just offshore to act as a holiday retreat for locals. For a long time, it worked well. But the area that was fine for a port of the 1860s is not fine when it comes to the nature and number of ships travelling the globe these days. Largely because of the shallowness of the bay (which contributes to it being a biodiversity hotspot) and the sediment input from the Ross and Burdekin Rivers, huge regular maintenance dredging programs are required just to keep the port open. 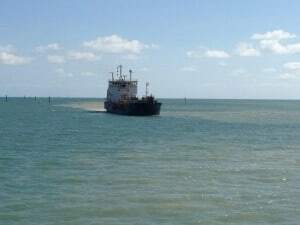 During the period 16 July 2000 to 10 September 2012 a total of 1.88 million m3 of spoil was dredged from Townsville port, within the Great Barrier Reef World Heritage Area (GBRWHA). In comparison no such maintenance dredging was required in Bowen, Gladstone or Hay Point. Figures provided by Senator Stephen Conroy (in response to a question on notice by Senator Larissa Waters on 24 August last year) show that dredging and dumping in the GBRWHA and in the Great Barrier Reef Marine Park (GBRMP) is massive (see Table 1). Excludes Shute Harbour, part of Gladstone, Balaclava Is, Great Keppel Is, Port Alma, Princess Charlotte Bay, part of Abbot Pt. As I write this, the dredge ‘Brisbane’ is coming to the end of its 56-day program of regular maintenance dredging for the Port of Townsville. The program will see more than 400,000 m3 of spoil dredged and dumped in the ‘Dredge Material Placement Area’ (DMPA), in the World Heritage Area and about halfway between Cape Cleveland and the northeast tip of Magnetic Island. Despite this, the Queensland government has identified Townsville as a ‘Priority Port Development Area’ (along with the ports of Brisbane, Gladstone, Hay Point/Mackay and Abbot Point), and a proposal to increase the size of Townsville port from 23 million tonnes per annum (Mtpa) to 56 Mtpa is currently being assessed. This proposed increase makes no sense when it is noted that in 2012/11 the port used less than 50% of its capacity, and that no need for the expansion has been identified by the Port of Townsville Ltd, a government-owned corporation. The proposed expansion would see 9.9 million m3 of spoilbeing dredged, with 5.6 million m3 of this being dumped in the DMPA. No figures are available for maintenance dredging into the future should the expansion go ahead. It is this proposal that has Magnetic Islanders up in arms. Islanders are concerned that the impact of such a massive capital and ongoing maintenance dredging program, with spoil being dumped within 6 km of the Island, would be the death knell for the island’s water-based tourism industry, to say nothing of the lifestyle of residents. The development debacle at Gladstone has seen the port become internationally known for its water quality problems. And the recent announcement by Federal Minister for the Environment Greg Hunt that he will no longer allow dredge spoil from that port to be dumped in the sea, may well be too late to save the ocean around Gladstone. The size of the problem up and down the coast can best be summarized by looking at some of the numbers. Gladstone has seen over 47 million m3 of dredging take place in the last 13 years. Abbot Point, near Bowen, is slated to become Australia’s largest coal export port, with massive infrastructure, dredging and dumping of 3 million m3 of spoil, and devastation of the adjacent Caley Vally wetlands. In Cairns, since the beginning of 2000, the Great Barrier Reef Marine Park Authority has approved the disposal of 10.7 million m3 of dredge spoil in the Great Barrier Reef Marine Park – the result of dredging just to keep the port operational. With the Great Barrier Reef on the point of collapse, this type and level of abuse is nothing short of scandalous.